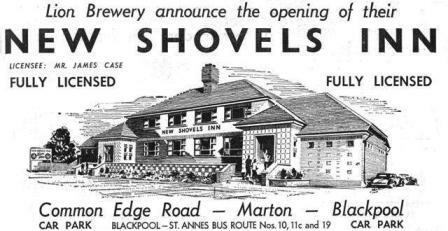 VISITORS to Blackpool who have been In the Shovels Inn, Common Edge-road, Marton, in the past just "won't know the old place" when they go there again this summer. The new inn, which opened yesterday, has been built adjoining the old building, which is to be demolished shortly. When that happens this famous Marton landmark will disappear after a history dating back 150 years. Subsidence had caused large cracks in the walls which, in some, places were shored up. 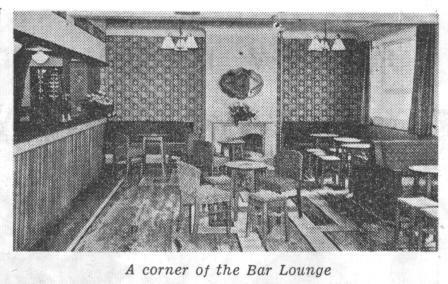 It was decided that it would not be a practical proposition to carry out structural repairs, so it was agreed to build an entirely new inn. The new inn has been designed on modern lines. The materials used have given it a bright but not gaudy look and the building fits in well with the surrounding district. It is also about four times larger than the old place, the building itself covering about 6,000 square feet and the entire site covering about three-and-a half acres. A feature of the new Shovels Inn is the large coach park which is laid out in buff coloured gravel. The architect has guarded against subsidence. The inn is built on boggy ground, prevalent in that part of Marton, but as a safeguard he has allowed for more than 50 piles to be sunk more than 20 feet into the ground. All the walls are carried or reinforced beams on the ones. THE new Shovels Inn, built adjoining the old inn on Common Edge-road, Marton, is the last word in modernity and comfort. It is built of cherry red rustic brick and reconstructed stone. The roof is of Westmorland green slate, and large windows provide ample light for the interior. The two front entrances lead directly to the bars. A terrace joins the two entrances. Inside there are three big rooms—a lounge bar, public bar and a very spacious recreational lounge. There is a long central serving bar and at the rear there are wash-up and staff rooms, and a bottle store. The whole is tastefully decorated. The top floor of the two-storey building provides ideal living quarters with four bedrooms, lounge, kitchen, bathroom and office. Work began last June and the premises have been completed in less than 12 months for the new Shovels Inn was opened yesterday. 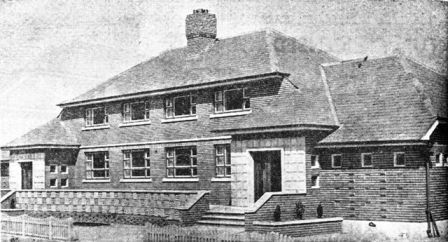 It was designed by Mr. L. Normington, architect to Matthew Brown (Lion Brewery) Ltd., in conjunction with Messrs. MacKeith, Dickinson and Partners, architects, of Blackpool.